A direct competitor in many ways to Canon's PowerShot A590IS � not least with its headline 8.1 effective megapixel resolution and better than average zoom range for its class (Canon offering 4x, Nikon trumping it here with 5x) � Nikon's Coolpix P60 point-and-shoot marries beginner-friendly simplicity to a better than expected for the cost if once again hardly innovative feature set. As with the still current Coolpix P50 we reviewed late last year, alongside that headline resolution you get light sensitivity up to a better-than-average ISO 2000, for an official price tag of �199 (a quick web search revealing prices as low as �155 however) that appears like very fair value. The P60's Vibration Reduction-equipped zoom range is however broader that its predecessor, stretching from 36-180mm in 35mm equivalent terms, compared with the P50's 28-102mm � though of course the latter does boast that useful wide-angle option. Both traditionally modeled budget 'P' cameras take some of their design cues from Nikon's top of the 'Performance' range P5100, although unsurprisingly given the cost, the P60 is physically larger while being less feature-rich. Like the earlier P50, the 'devil' of the entry-level P60 is literally in the detail; nice little touches like the leather-look (but in fact slip-proof rubber swathed) grip that houses two AA batteries provide an outward air of sophistication, as does the no nonsense matt black finish; its solid construction suggesting this as a same brand (though much pared down) pocket back up for someone who owns a budget-level DSLR like the D40 or D60. Bettering the P50, this time you get true 'VR' � in other words CCD-shift image stabilization � rather than the software-enhanced electronic variety. Again though, disappointingly the full manual for the P60 is provided only on CD ROM. The frill-free front of the Nikon Coolpix P60 is dominated by its 5x zoom lens that stands slightly proud of the faceplate even when not in use. Unlike Canon's A590IS, the metal ring that encircles it is not removable to allow the attachment of conversion lenses. Immediately above the lens, and therefore presenting the very real danger of red eye in portrait shots, is a very thin strip of a window for the built in flash, adjacent to which are three tiny pinholes in the faceplate to allow the built-in microphone to do its job. Luckily there's a red eye reduction setting among the flash options. To the other side of the flash bulb is a self-timer indicator lamp. At the top of the Coolpix P60 a large shutter release button sits on the forward slope of the grip. Although it's difficult to physically determine the half-way point when pressing down on it, confirmation that focus and exposure has been determined and you're ready to fire off a shot is given by an affirmative 'bleep', with a green framed focus point appearing on screen (this appears red if you're too close for the camera to properly focus). The P60 is reasonably quick to ascertain focus, and while there's little in the way of shutter delay some is noticeable, the screen blanking out momentarily when the shutter is fired. If we're picking holes, the 2-3 seconds however that it takes to commit a full resolution JPEG to memory also feels sluggish, and on several occasions I had to press that unresponsive shutter button a couple of times for the P60 to realize I wanted to take a further shot. Behind this button sits the slightly recessed power on/off button that gets things rolling in around two seconds when pressed, flashing with a cool green light when the camera is in energy-saving standby mode. To the left of this on/off button is a familiar looking bottle-top style mode wheel. Like Canon's A590IS, you get slightly more than full auto on offer � namely here program and manual capture, plus movie, set up, night portrait, landscape, portrait, scene (15 possible selections) and high ISO modes. The wheel doesn't quite have the firmness of its Canon competitor, meaning it's possible to over-shoot your chosen option in the heat of the moment, plus it takes a second or so for the camera to catch up with and register your choice. Left of this again is the P60's small, built-in speaker. 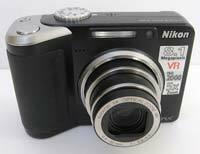 More unusually for a point-and-shoot camera, at the back the Nikon Coolpix P60 features not just a rear LCD monitor � at 2.5-inches a tad larger than that of the P50, but also an optional electronic viewfinder top left of it. Like the P50, screen visibility was slightly murky to my eyes utilized indoors, and almost invisible used outdoors in sunshine, not helped by the fact that its 153k-dot resolution falls below the current average for its class. Though I can imagine it being overlooked by most of the P60's target audience, the alternative 201k dot EVF at least provides better visibility when it's sunny out, an unassuming button for its activation, denoted by a screen icon, sitting alongside. The main LCD is deactivated while the EVF is in use, but a subsequent press of the icon button turns it back on, and naturally the EVF off. As with the P50, there is no compositional grid or live histogram provided on the screen in capture mode, though the former can be activated via 'monitor settings' in set up mode if so wished. Otherwise you can choose to either view all standard settings or turn them off, and that's it. Top right of the P60's back is a slender plastic-y rocker switch for activating the on-board zoom, which, though slow, is more responsive and smoother in operation than that of the A590IS. The camera's ergonomics are slightly better too; the zoom lever falls readily under the thumb as your forefinger hovers over the shutter release button, leaving your other three digits to tighten on that larger, more rounded grip. The zoom mechanics are also less noisy and intrusive than the P50 or A590IS. Maintaining a user-friendly feel, the Coolpix P60's other clearly-delineated rear controls are kept to the bare minimum, with, beneath the zoom rocker, a dedicated playback button (the playback menu including Nikon's exposure adjusting D-Lighting option, along with the ability to reduce image size in-camera for email), under which is a tactile four-way control pad for tabbing through screen options and captured shots, with central OK button for effecting menu choices. 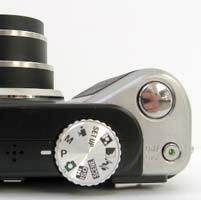 At points north, south, east and west are means of selecting the flash options, macro/close up mode (down to an acceptable if unremarkable 10cm from your subject) that also affords access to AF or infinity focus, self-timer and adjusting exposure compensation (+/- 2EV). Bottom left of this is a self-explanatory menu button, while to the right you get the last of three dedicated buttons, this time for deleting duff images. 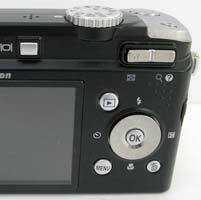 Moving to the right hand flank of the Nikon Coolpix P60 � if you're viewing the P60 as any user will from the rear � you find a small plastic flap covering the combined AV out and USB port, hiding beneath a loop for attaching the supplied wrist strap. The opposite side of the P60 is bereft of any features at all. The Nikon Coolpix P60's base meanwhile features a centrally positioned screw thread for attaching a tripod, and, at the base of the grip, a slide-open cover that hides the compartment for the two supplied AAs and optional Secure Digital card (with a measly 12MB of internal memory to otherwise fall back on to get you started). Battery life is respectable given that everything is running on AAs � offering around 190-200 shots � meaning that they last a lot longer than the five minutes offered by entry level models when digital first went mass market. So what of picture quality? Does the Nikon Coolpix P60 deliver results that transcend its point and shoot ease of use and budget-friendly price tag, or fall short of what's expected? PhotographyBLOG is a member of the DIWA organisation. Our test results for the Nikon Coolpix P60 have been submitted to DIWA for comparison with test results for different samples of the same camera model supplied by other DIWA member sites.